Issue: International airport affiliates wish to re-sell executive lounge and security priority passes. Description: London Luton airport offers priority lounge access and rapid security clearance lanes for passengers. With a host of 3rd party suppliers available to the airport they want to allow relevant suppliers the ability to order and supply passes to passengers before they arrive at the airport. Benefit: Web services operate 24/7 so there is no need for call centres or more staff to man administration centres. In conjunction with UK touch screen manufacturer Touch4, web services allow advance purchase of passes and then subsequent scanning and security checking of the passes at departure lanes. 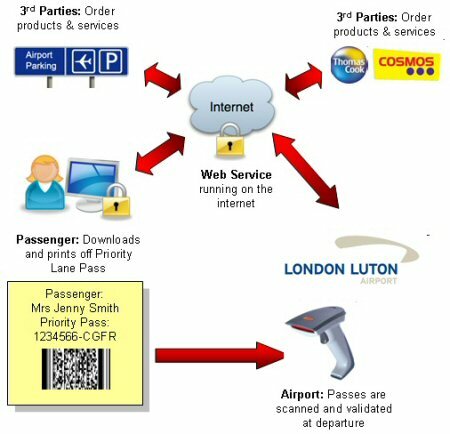 Solution: Web services were developed to allow 3rd parties to order these products and then provide an email or link to the passenger to print off their own 2D-Barcode pass.